I am looking forward to my family's upcoming annual summertime trip to the Hamptons, where we will spend a great deal of time on the beach with my parents and childhood friends (and their children!). Already, I am starting to think about what I am going to pack, because for the last few years, I've packed clothes more suitable to LA than New York--i.e., chunky sweaters appropriate for California's cool summer nights, too many jeans, and an overly ambitious amount of yoga wear. Not this year. 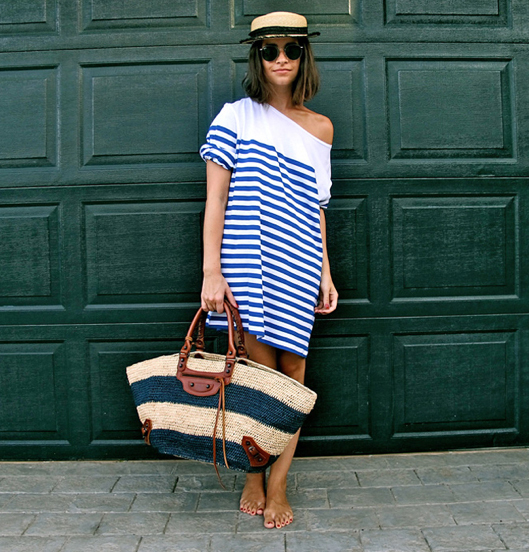 So far, my working East Coast-ready, humidity-friendly packing list includes a pretty embroidered apres beach tunic, throw-it-on-and-go striped dress, and these new round Ray Ban sunnies, inspired by the ones worn by Moscow-born and New York-based blogger and fashion consultant Miroslava Duma, pictured above. In fact, if I can personify this whole breezy-chic look, it will make what will already be an enjoyable trip that much more satisfying. I can't find an English translation for Miroslava's blog Buro 24/7. Is there another website for her? Where can i find her dress?? ?